The Marine Stewardship Council (MSC) was created as a conservation tool – intended to provide ''the best environmental choice in seafood'' to consumers and to create positive incentives that would improve the status and management of fisheries. During its 15 years, the MSC, which has an annual budget of close toUS$20 million, has attached its logo to more than 170 fisheries. These certifications have not occurred without protest. Despite high costs and difficult procedures, conservation organizations and other groups have filed and paid for 19 formal objections to MSC fisheries certifications. Only one objection has been upheld such that the fishery was not certified. Here, we collate and summarize these objections and the major concerns as they relate to the MSC's three main principles: sustainability of the target fish stock, low impacts on the ecosystem, and effective, responsive management. 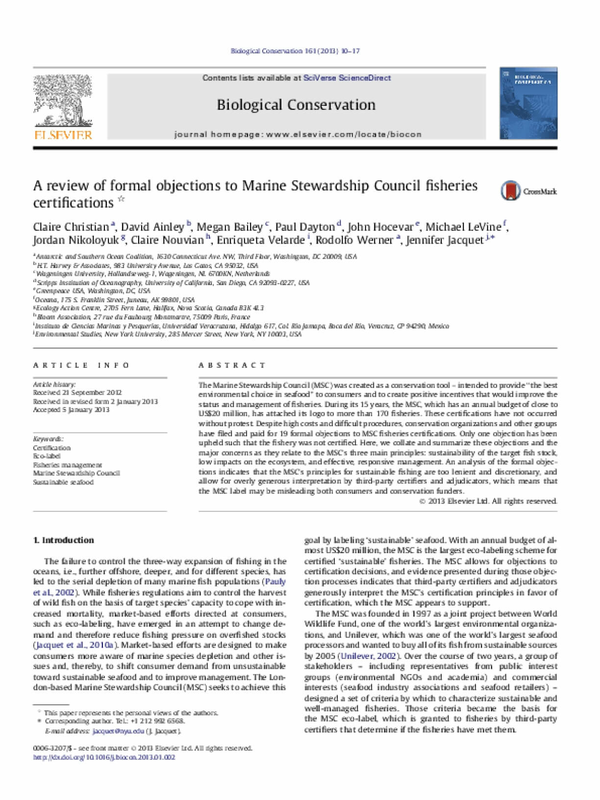 An analysis of the formal objections indicates that the MSC's principles for sustainable fishing are too lenient and discretionary, and allow for overly generous interpretation by third-party certifiers and adjudicators, which means that the MSC label may be misleading both consumers and conservation funders. Copyright 2013 by Biological Conservation. All rights reserved.